Academician Samson Semenovich Kutateladze (1914-1986) is a world famous scientist in the field of thermophysics, hydrodynamics of gas-liquid systems, and new problems of power industry. He created one of the leading scientific schools in the field of thermophysics and hydrogasodynamics. Scientific work of S.S.Kutateladze began in the I.I.Polzunov Central Boiler-and-turbine institute, where he has gone to work as a laboratorian in 1932. 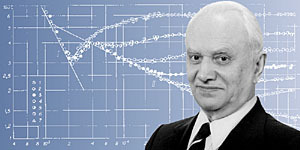 In 1933, he completed the first complex simulation of steady-state and non-stationary thermal conditions of underground heat extraction pipelines, and in 1935, he proposed a model of turbulent free convective flows that has been justified experimentally in the USSR and the USA just in the late 60s. He has laid the groundwork for the analysis of the similarity of heat exchange and hydrodynamics under changes of a state of aggregation of matter; he has introduced a fundamental criterion (the ratio between latent heat of evaporation and overheating heat of one of the phases) that reflected the features of heat exchange during every physicochemical transformation. 24-year old, S.S.Kutateladze becomes the author of the monograph "The fundamentals of heat exchange theory under change of a state of aggregation of matter", the first in the world literature on the topic. Since January 1941 to August 1945, S.S.Kutateladze was in the Armed forces of the USSR. He was involved in fights and has been wounded. As he returned in CBTI after demobilization, he continued the study of thermohydrodynamics of gas-liquid systems and in 1949, he had acquired radically new results that finished with the creation of hydraulic theory of crises under bubble and film boiling regimes and with the deduction of several important ratios for axisymmetric currents of gas-liquid streams in pipes. In 1950, Samson Syemyenovich has defended a candidate, and in 1952, a doctor dissertation. These years he developed principles of the analysis of hydrodynamic stability of the existence of various regimes of current of gas-liquid mixtures. Together with academician M.A.Styrikovich, he wrote in 1958 the monograph "Hydrodynamics of gas-liquid mixtures", where the authors pioneered in the world literature in generalizing theoretical and experimental research of that time on the problem. In 50s, under the guidance of S.S.Kutateladze, a cycle of theoretical and experimental works on the study of heat emission and hydrodynamics of molten metals has been completed, on the basis of which with a collective of authors he published the USSR first monograph on liquid-metal heat-transfer media. It was a weighable contribution to the formative stage of the national nuclear power. In late 50s, research into wall turbulence began playing important part in his scientific activity. By that time, S.S.Kutateladze moves to work in the Siberian Branch of AS USSR where he gives great attention to the formation of subjects of the Institute of thermophysics. Since the middle 60s, Samson Syemyenovich pays great attention to the studies of the structure of turbulent boundary layers, including those under conditions when non-Newton effects manifest themselves in liquids. Together with his disciples, he continued investigations into hydrodynamics of biphase streams, revealed boiling mechanisms for molten metals, studied phenomena when film boiling appears without the stage of stable bubble boiling, worked out electrodiffusive method of diagnostics of the gas-liquid streams that allowed one to gain exhaustive information on the flow pattern and on its interaction with surfaces. In 1964, S.S.Kutateladze has been elected the director of the Institute of thermophysics. His talent of a great organizer of science broadly manifested here. The work of S.S.Kutateladze has determined the development of the Institute's investigations into dynamics of a dilute gas, into radiation-conductive heat exchange, and a formative stage of applied research on the creation of new power units. Samson Syemyenovich is the founder of one of the leading scientific schools in thermophysics and hydrodynamics. More than 60 of his disciples and direct collaborators became candidates; more than 30 of those became doctors of sciences, and several of them became the full members of the Academy of sciences: A.I.Leontyev, V.E.Nakoryakov, A.K.Rebrov, and E.P.Volchkov. He managed to combine perfectly scientific and pedagogical activity. Since 1962 he was the professor, and then the Head of the Thermophysics Sub-Faculty of the Novosibirsk state university. Since the late 1970s, typical of the scientific work of Samson Syemyenovich was creation of large summarizing papers, a significant place among them belongs to the monographs "Fundamentals of the heat exchange theory" (republished for 5 times), "Analysis of Similarity in Thermophysics " (1982), and "Analysis of Similarity and Physical Models" (1986). Results of the studies of the school of S.S.Kutateladze in the field of thermohydrodynamics of biphase currents are given in the widely known monograph "Heat and mass exchange and waves in gas-liquid media" (1984) that was written together with V.E.Nakoryakov. Even being ill, Samson Syemyenovich worked with enthusiasm on the "Heat Transfer and Hydrodynamic Drag Force" handbook. 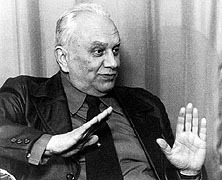 S.S.Kutateladze has written the total of 20 monographs and almost 300 articles. Great scientific and working merits of Samson Syemyenovich have been awarded with a large number of government awards, he was granted the rank of the Hero of Socialist Labour, the State premiums of the USSR and RSFSR, the I.I.Polzunov premium of AS USSR, the M.Dzhekoba international medal. Commemorating academician S.S.Kutateladze, a memorial board has been put on the building of the Institute of thermophysics, where he worked, that has been named after him. A premium of S.S.Kutateladze has been established for young scientists of SB RAS. A street in Academgorodok has been named after him. * Istochniki: 1) Samson Syemyenovich Kutatyeladzye (K 70-lyetiyu so dnya rozhdyeniya) // Inzhyenyerno-fizichyeskii zhurnal. - 1984. - T.47. - N 2. - C.341-343. 2) K 90-lyetiyu so dnya rozhdyeniya akadyemika Samsona Syemyenovicha Kutatyeladzye // Tyeplofizika i aehromyekhanika. - 2004. - N 3. - S.497-498. Dokumyent izmyenyen: Wed Feb 27 14:46:36 2019. Razmyer: 12,874 bytes.